Hockey veteran Len Quesnelle has joined Head Coach David Quinn’s staff as assistant coach, replacing Scott Young, who departed this summer to become Director of Player Development for the Pittsburgh Penguins. 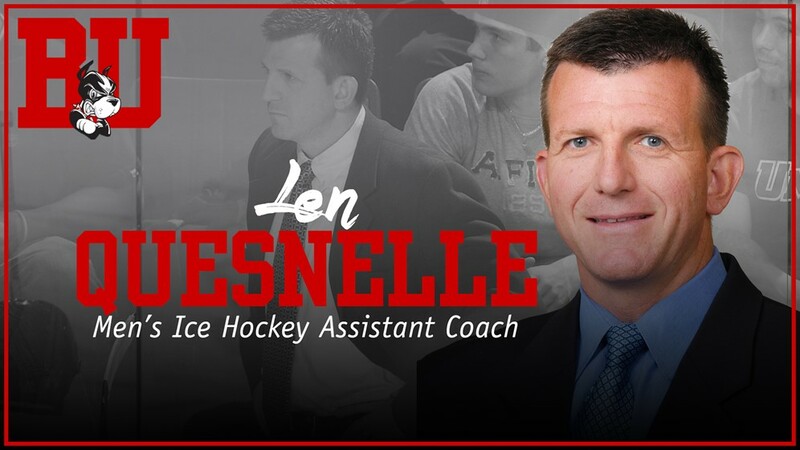 Quesnelle, an amateur scout for the Detroit Red Wings for the past four seasons, brings substantial college hockey coaching experience to the Terriers. The Bramlea, Ont., native spent 12 seasons on the Princeton staff as an assistant, before succeeding former Terrier Don Cahoon as head coach in 2000. Four years later, he rejoined Cahoon as his assistant coach at UMass and helped lead the Minutemen to the NCAA Regionals in 2007, their first-ever appearance in the national tournament. He left UMass following the 2012-13 season. As a Detroit scout, his focus has been on high school, junior and NCAA players in New England. ► Young spoke with the Pittsburgh Tribune about the career path that brought him back to Pittsburgh, where he had won a Stanley Cup in 1991, to be reunited with his former BU linemates, Penguins Coach Mike Sullivan and Wilkes Barre/Scranton Coach Clark Donatelli. A 342-goal scorer in 17 NHL seasons, Young also was recently named to the U.S. Olympic hockey staff for the 2018 games and was selected for induction into the U.S. Hockey Hall of Fame. SB Nation offers its take of the top 25 NHL-drafted prospects to follow in college hockey this season. The list has a decidedly BU flavor with seven drafted Terriers included: Dante Fabbro, Jordan Greenway, Patrick Harper (photo), Shane Bowers, David Farrance, Chad Krys and Jake Oettinger. ► Agganis Arena will host a game matching the U.S. Women’s National Team and the Canadian National Women’s Team on Wednesday, Oct. 25 at 7:30. The game kicks off a seven-game tour for the U.S. women in preparation for the 2018 Olympic Games in PyeongChang, Korea.